OK, assuming that everyone is following the rules, life becomes simple for you and for everyone else who is on the road. The guy in the back can patiently wait until you go. Stop signs can be frustrating too. 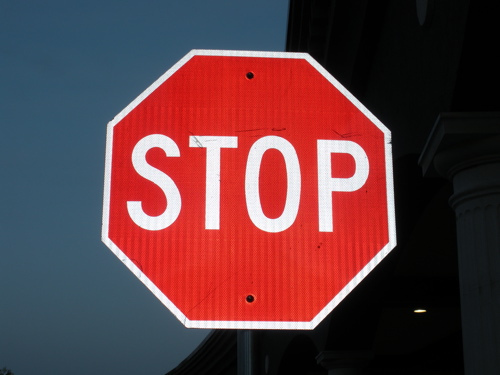 When you are on the road you may get stop signs every signal until you reach your destination and sometimes you might not get any stop signs on your way. When you reach the destination, you might find other people who have chosen to take the freeway to the same place and they report that they didn’t have ANY stop signs. You might also meet some people who were brought there by chauffeur driven cars and they don’t clearly remember whether there were stop signs or not. To take it to an extreme, you might also meet people who flew in via a helicopter to the same place and let alone stop signs, they were not even familiar with the road you took to reach there. Whatever be the case, we go back to the fundamental point – at a stop sign, you stop but only temporarily. Then you get going again irrespective of how it’s working out for others. Life is the same way in many ways and the same rules apply – when you find a stop sign, you stop, but, only temporarily. Then, you get going again!